I've never really been clear on why Earth gets to have four Green Lanterns. It used to bug me but the whole restructuring of the Corps that the Guardians (by whom I mean Geoff Johns) have done solved that by giving each sector two fulltime Lanterns and creating some special ranks to keep other prominent ring-slingers active for readers those in need. In addition to Hal Jordan, John Stewart is the full time Green Lantern for sector 2814 - and that's a good thing, because he's really the only popular costumed DC superhero who is black and is therefore an important icon for their marketing department. When Green Lantern Hal Jordan was incapacitated en route to a JLA adventure, Hal's power ring sought out and selected architect John Stewart to be Hal's "alternate" peacekeeper for space sector 2814. Honest and utterly without fear, John was eventually awarded his own power ring and full-time status as a Green Lantern in his own right. He continues battling evil as a Green Lantern, his dedication earning him full membership in the JLA. My real introduction to John was through the JLU tv show (what - he's not a cop/marine?) where he was portrayed as a "no funny business" one-note character. As a result, I can't say I've ever been that interested in him. Sure he suffers that GL curse of being a one-dimensional character, but I've just not read or seen anything to elevate him from being "the black Green Lantern." Here's hoping Johns can fix that too. The most notable thing, about John Stewart (other than that he doesn't have late night show on Comedy Central - a-HA, thank YOU!) is his costume, which is predominantly black in color. This bugs me. Partly its just boring to look at but mainly it ties in to my biggest problem with the Green Lantern Corps - they don't wear a uniform! A uniform is, by definition and name, uniform! Its not some willy-nilly "reflects-the-individual" namby-pamby nonsense! What makes things particularly annoying to me is that 25% to 33% of all GLs have the same costume, so some of them definitely appear to get the concept, which just draws attention to the others. Would the police or the army allow their members to "dress as they will" on duty? Heck no - and neither should the Guardians, especially since they already have a reputation for being hard-lining, intergalactic d-bags. I get that some of the aliens don't fit into "normal" clothes and that it gets boring for artists to draw the same thing over and over, but guess what - deal with it! You're just lessening the credibility of the concept. Costume complaints aside, Johnny-boy here sports his standard duds, which happen to be what he wore on JLU as well, so, in a way, he makes a little love-bird duet with the JLU-based Hawkgirl from Series 8. That might get a little awkward since this series also includes his dead wife Katma Tui. Boy loves his non-terrestrials. At any ol' rate, the paint is simple and clean with the plastic cast in green with black paint over it. 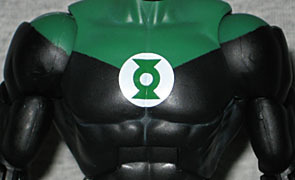 His shoulder "rings" are cast in green too, which is fine, but it gives him permanent green armpit hair. His gauntlets are painted with a slightly metallic green, which looks great but also makes the shoulders and boots look cheap. 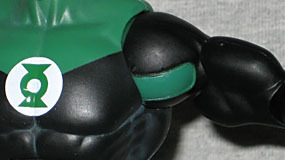 The forearms are unique sculpts, but since they are generic wristbands they can be easily reused for future figures. In addition to the head (which suffers double-barbell immobility), the only other new sculpt is the right hand, which has John's specific ring on it. Cudos to the details. However, other than the incredibly welcome addition to building our GL Corps, the most notable things here are the accessories - oh yes, we've gone plural! Not only does he include the ubiquitous Collect'n'Connect body part (in this case Kilowog's left arm - build that Corps!) but also two different ring constructs - those cool green manifestations of a Green Lantern's will! In this case we're looking at a big swooping fist and a forearm mounted gun. I have to say, though, these are far better in theory than in execution. Starting at the point of origin, they tried to capture the luminescent "glow" of the ring but sculpting little spike-y points - this just looks more like battle maces than light energy, unfortunately, and give the whole thing an odd look. The "fist" also looks weird because it originates for the ring - i.e. starts off thin, but becomes an oversized fist - so it goes from pretty small to pretty big in an uncomfortably short distance; a distance short enough that it begs the question of "what's the usefulness to John?" The gun, though, looks better. Its much more detailed and has a nice "flow" from ring to gun. However (yes there's always a "however,") the gun is meant to rest on the forearm so that the barrels don't stick very far out. The effect is likewise somewhat unthreatening. All of these short-comings are a result of the practicalities of the size and strength of the articulated arm, so ultimately they can be overlooked. If nothing else, there are now two constructs you use can use for dioramas - and best of all, they both also fit onto Hal Jordan's fist too! 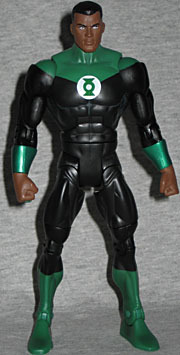 For me, John Stewart is the least impressive figure of DCU 11, but is conversely the most desirable character - go figure. Odds are if you're into Green Lantern or DC Classics, there is no chance you won't buy this figure; and if you're not, I must confess - you aren't missing much. DC Direct has likewise released a new John Stewart figure in their second series of Blackest Night figures, so if you're a Stewart fan, now is a good time to be alive!